TYPOLOGY / ART OF DARKNESS: Amazing Building-wide Event – get 50% off! 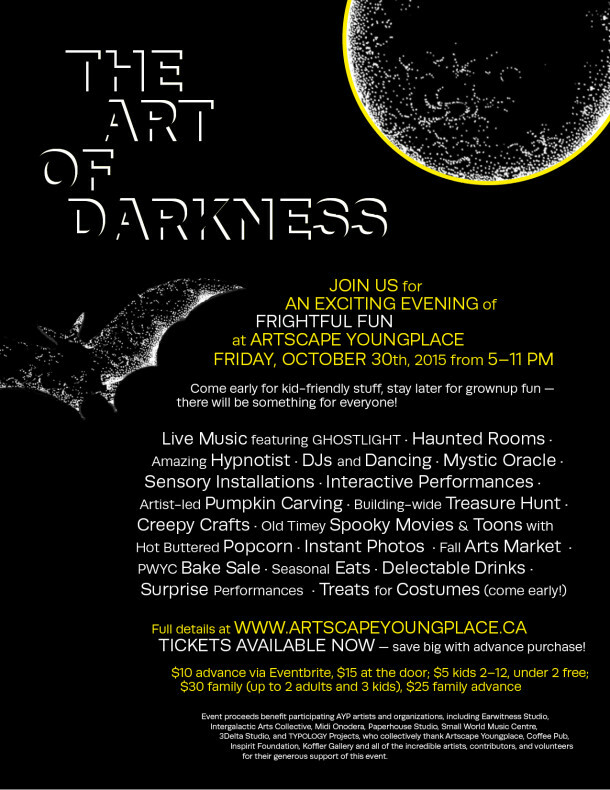 Join us this Friday from 5–11 for a major building-wide Halloween-themed event organized by artists and organizations at Artscape Youngplace, including TYPOLOGY. See below for all the amazing stuff we have in store for all ages. Our faithful mailing list subscribers receive 50% off advance tickets with the discount code “DARK” on the Eventbrite page! Get into the Halloween spirit with the artists at Artscape Youngplace. On Friday, October 30th, we’ll fill the building with activities and events that reflect the mysterious, the shocking, the haunted, and the bizarre. Join us for peculiar performances, mind-bending music, otherworldly art installations, fantastical films, and so much more. It will be an artfully dark and frightfully fun evening for a good cause, with proceeds supporting participating artists and organizations that call Artscape Youngplace home. Ticket price includes all activities, performances, films, and interactive installations, plus a chance to win goods, services, and gift certificates from AYP artists, organizations, and supporters including: Paperhouse, Eve Egoyan, TYPOLOGY, Inspirit Foundation, 3Delta, Graven Feather, Angel Ness Ho, Midi Onodera, Stephanie Avery, Coffee Pub, Lucky Penny, Koffler Gallery, Miriam Grenville, Catherine Marrion Expressive Arts Therapy, Wendy Coles/Fun with Music Together, Magic Languages, The Smart Cookie Club, Theatre Passe Muraille, Amelia Ehrhardt, and more. Amanda-Mazing takes consenting participants on a fascinating inner journey — prepare to be amazed! instant photos of you and your friends anywhere in the building for just $2 a snap. Come in costume for extra effect! by the Coffee Pub — open late and in costume!